The poems and sayings of the mysterious book of wisdom called Dao De Jing have powerfully affected many aspects of Chinese philosophy, culture, and society. In the realm of aesthetics the idea of Dao, or the Way, a transcendent natural principle working through all things, has inspired artists and poets, who have sought to represent nature in its raw wholeness or have depicted vast landscapes within which human structures and pathways, overwhelmed by mists, mountain faces, and water vistas, hold a tiny and precarious place. With regard to personal spiritual cultivation Daoism offers techniques of concentration and self-control, while in the realm of physiology the Daoist theory of natural cycles points toward systems of internal circulation and techniques of rejuvenation.1 In its ethical application Daoism teaches self-subordination and frugality and warns of the self-defeating consequences of assertiveness and aggrandizement, whether political, military, or personal. In the realm of governance political theorists influenced by Laozi have advocated humility in leadership and a restrained and concessive approach to statecraft, either for ethical and pacifist reasons or for tactical ends. The well-known line that opens stanza 60, "Rule a great state as you cook a small fish," has been used in China and in the West as an argument for a "light touch" in governing: the Way creates sufficient order. In a different political context, one mediated by legalist theories of government, a transcendent Way has served to legitimate state builders in constructing impersonal institutions and formulating all-powerful laws. Indeed the marriage of the Way with law (fa) is one of the earliest transformations and adaptations of Laozi's thought.2 On the popular level, by contrast, various anti-authoritarian movements have embraced the Dao De Jing's teachings on the power of the weak. Thus the Dao De Jing, in the world of philosophy a small kingdom in its own right, has spawned diverse schools of thought, and these have elaborated upon and spread widely the original teachings—often in ways that might have surprised or distressed their creator. The Dao De Jing has so wide a compass that it is difficult to think of a comparable work in the Western canon. Passages on nature's patterns of motion and their indifference to man's purposes may evoke for a Western reader themes and language found in Lucretius and his model, Epicurus. If some stanzas concerning statecraft and tactical maneuver suggest Machiavelli, others suggest Gandhi, who personified in his leadership principled humility, minimal struggle, and simplicity of lifestyle. For some readers Laozi's aphorisms and resigned reflections on human life may evoke lines in Ecclesiastes or Proverbs. Comparisons have also been made with Thoreau's warnings about economic overdevelopment and government..
With so many English versions of the Dao De Jing, why another? There is much of value in most of the English translations, but each is only partially successful. The synergy of the work's themes as well as the concision of its phrasing make many of its stanzas so ambiguous and suggestive that definitive interpretation, much less translation, has often proved unattainable. Rendering in another language a work that says so much in so few words, and about whose meanings scholars differ greatly, can only be problematic. Even in Chinese, many Dao De Jing passages seem like paintings of striking detail that compel the gaze but always remain partly out of focus. Each translator tries to refine the images or to find fresh language to capture the power of Laozi's gnomic lines. In the end, however, the only justification I can offer for a new attempt is that it is meant not only to improve but to be improved upon. The cumulative effect of multiple translations contributes to the understanding of the Laozi, just as the ongoing performance tradition of musical works yields new possibilities of expression and appreciation. For example, according to the research of one of the leading contemporary Laozi scholars, Yin Zhenhuan, it is likely that the true number of individual stanzas is not eighty-one but as many as 112, some of which, like passages in the Analects, are only four or eight words long.4 For convenience of reference and for the sake of continuity, however, the traditional order of eighty-one is followed in this translation. Ornaments indicate probable stanza divisions within a conventional stanza. The title Dao De Jing may be translated "Canonical text (jing) on the Way (Dao) and virtue (de)." But this now-universal title did not become widely used until the Tang dynasty (a.d. 618-905), when Laozi was officially regarded as a divine guardian of the dynasty. Laozi is the older title, going back almost to the creation of the text. 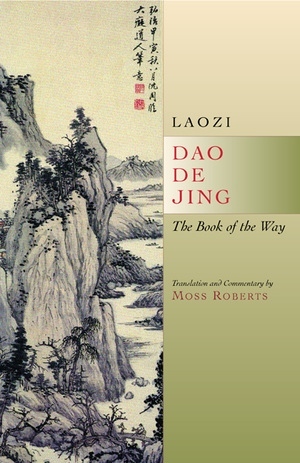 Although scholars now generally use the two titles interchangeably, Dao De Jing suggests an established classic in the Chinese philosophical tradition, while Laozi is more modest—"the words of Master Lao," perhaps. Like the Mozi, the Guanzi, the Mencius, and other titles for writings and records collected under the name of a central figure, Laozi suggests a historical document and its original context rather than a canonical work. To reflect the difference between the two titles, in the present work Dao De Jing is more frequently, albeit not exclusively, used in the introduction, and Laozi in the comments. It is an open question how pleased the self-effacing Laozi would have been to see his little book classified as a jing—or for that matter himself as a divinity. The Dao De Jing has come down to us in eighty-one stanzas, a form set slightly before the Christian era began; stanzas 1-37 constitute the first half, stanzas 38-81 the second. Although there are several versions, they are not dramatically different from one another. Two of the versions are named after their scholarly annotators, the Heshang gong Laozi and the Wang Bi Laozi. A third, the Fu Yi Laozi, is named for the Tang-dynasty Daoist scholar who published a text unearthed in a.d. 574 from a Han tomb dating from about 200 b.c.5 Present-day scholars usually call the current common text the "received text" to distinguish it from recently discovered manuscripts. Let us leave the recent manuscript discoveries and turn to information on the Dao De Jing in texts long available. Most traditional Chinese scholars (and a number of modern ones as well) have held that the Laozi reflects substantially the time of Confucius, that is, the late sixth or early fifth century b.c., acknowledging occasional interpolations to account for anachronistic language suggesting a somewhat later period. Before the Guodian finds, many modern Chinese and Western scholars argued for a date ranging from the early fourth to the late third century b.c. because sightings of a Laozi in Chinese works of the third century b.c. are so fragmentary. One finds lines or partial stanzas, the authorship of which either is not indicated or is attributed to someone named Lao or Lao Dan; but this attribution is not systematic. The Zhuangzi, for example, is a Daoist text of the late fourth to early third century b.c. collected under the name of the philosophical recluse Zhuangzi. This work contains several Dao De Jing lines or partial stanzas. Sometimes these are attributed to Lao Dan, yet sometimes these quotations from Lao Dan say things that are not in the Laozi, though they are compatible with its ideas. In the Zhuangzi and other contemporary texts we find references to the Shi, the Odes (later the Shijing), and the Shu, the Documents (later the Shujing), suggesting that these are titles for bodies of shorter works. But it is only in the Han Feizi, a compilation of writings on law and statecraft attributed to diplomat and strategist Han Feizi of the late third century b.c., that references to Laozi's work suggest a substantial text; that is, the Han Feizi includes some Dao De Jing stanzas that are more or less complete. Han Feizi was influenced by Laozi, and he analyzes a number of stanzas in two of his chapters, "Jie Lao," and "Yu Lao." Han Feizi's discussion of stanza 38, for example, opens the "Jie Lao." It was the absence of references to a recognizable oeuvre, Dao De Jing, prior to the Han Feizi that led many modern scholars, Chinese and Western, to conclude that the work took shape closer to the time of Han Feizi than to the time of Confucius. The Guodian finds of course suggest the opposite. In the Han period (206 b.c.-a.d. 220) the writings attributed to Laozi were referred to as the Daode, the Laozi, or the Laozi jing. Dao and de refer of course to two of the work's primary philosophical terms, the former belonging to the cosmic realm, the latter to the human. But Dao and de also refer to the two roughly equal sections of the text as it has come down to us: the Dao stanzas and the de stanzas. The first part of this text (stanzas 1-37) begins with a stanza devoted to Dao; the second part (stanzas 38-81) begins with a stanza devoted to de. According to one recent study, "the present eighty-one chapters were determined around 50 b.c." in order to make a "perfect number" of nine times nine.9 The oldest complete Laozi, the two Mawangdui texts, dating from about 200 b.c., closely resemble the received version, though neither one has numbered stanzas and both start with the de, or second, half (stanzas 38-81).10 Either this was the original order, or the de part became a text before the Dao part. The priority of the de stanzas had been suspected because the "Jie Lao" begins with stanza 38, and also because Wang Bi's (a.d. 226-249) edition appends to stanza 38 a lengthy annotation that is virtually an introduction. Against this hypothesis stands the fact that about half of the Guodian Laozi consists of Dao stanzas, half of de stanzas. It is not possible to say when the Dao section was placed before the de section. In his joint biography of Laozi and Han Feizi in the Shiji (Records of the Historian, a general history completed about 90 b.c. ), renowned Han historian Sima Qian (145-86? b.c.) refers to a five-thousand-word text devoted to the theme of Daode. But did Sima Qian see a text with the Dao stanzas coming first, or is he using the terms Dao and de in the order of their importance? Dao is of course the leading term and de must follow in its path; the words are not found transposed. The political philosopher Yan Zun (fl. 53-24 b.c.) used Daode in the title of his commentary Daode zhigui, of which only the de section survives. The philosopher Ho Yan (d. 249 a.d.) wrote a Daode lun. So the phrase Daode (still today a common term for "morality") had title status for the text. The present form of the Heshang gong commentary has the Dao stanzas first and seems to have been divided into a Daojing and a Dejing, but conjectures on the date of this important early commentary range from the reign of Emperor Wen of the Han (179-156 b.c.) to the fifth century a.d.11 The equally important Wang Bi (a.d. 226-249) version, Laozi zhu (zhu means annotations), dominant since the Song dynasty, also begins with the Dao stanzas. These two major commentaries, by Heshang gong and by Wang Bi, were attached to Dao De Jing texts and were the principal vehicles for the Dao De Jing's dissemination in China. There are, however, no editions of either commentary early enough to establish the original order of the two parts. It is almost as difficult to say when jing became part of the title. According to a citation in the Fayuan zhulin, an early Tang dynasty work, jing (canon, or classic) was probably not added to the title of the Laozi until the reign of the fourth Han emperor, Jing (r. 156-140 b.c. ).12 This source says, with reference to the Laozi, simply that a zi (philosophical) text was elevated to jing (canonical) status. It does not mention the title Dao De Jing. In Han bibliographies the work is referred to as the Laozi; variants on the title Laozi jing also occur. The title Dao De Jing is said to have been spoken by the third Han emperor, Wen, (r. 179-156 b.c.). The source is Ge Hong's (d. a.d. 341) biography of Heshang gong in the Shenxian zhuan. Although probably anachronistic with respect to Emperor Wen, this quote may be the first instance of this form of the title. Mention should be made of two important compendia of Daoist thought that contain many Dao De Jing passages. First is the Wenzi, a late Warring States (or possible early Han) text that contains lengthy essays built around formulas of the Dao De Jing; the essays often synthesize Confucian and Daoist terms and concepts. Second is the Huainanzi, a collection of essays called xun (teachings) that were profoundly informed by the Dao De Jing. These essays cover a wide variety of subjects. This work was sponsored and guided by the prince of Huainan, Liu An (179-122 b.c.). The Dao De Jing emphasizes the forces of nature and human interaction with them; the Analects emphasizes the social realm alone—human relationships, ethics, and political organization. The former stresses the relation of a transcendent Dao with the totality of its creation; the latter stresses hierarchical relations centering on the parent-child model and the particular obligations within clan and kingdom that are required of each person. For the former the highest authority is a maternal force that creates a gamut of ten thousand phenomena, humans but one among them; the latter honors an ancestral heaven that sanctions patriarchal dominion and elite lineage. The former idealizes the self-effacing leadership of the wise man or sage (shengren), who governs himself and others by keeping to the Way; the latter idealizes the superior man (junzi), a public role model who may advise the patriarch or even serve as a potential ruler in place of an unfit heir. As for religion in the sense of a deity interactive with humans, Laozi ascribes no consciousness to the Way, while Confucius, committed to an exclusive focus on human relations, cautiously advises a follower to respect the gods but keep them at a distance (Analects 6.20), a judicious compromise that the Chinese have by and large adhered to over the millennia. Dao De Jing is one of the richest, most suggestive, and most popular works of philosophy and literature. Composed in China between the late sixth and the late fourth centuries b.c., its enigmatic verses have inspired artists, philosophers, poets, religious thinkers, and general readers down to our own times. This new translation, both revelatory and authentic, captures much of the beauty and nuance of the original work. In an extensive and accessible commentary to his translation, Moss Roberts reveals new depths of Dao De Jing. This edition is distinguished by the literary quality of the translation, its new renderings for a number of the stanzas, and by Roberts's knowledgeable contextualizations. Utilizing recently discovered manuscripts and Chinese scholarship based on them, he is able to shed new light on the work's historical and philosophical contexts. This translation shows that Dao De Jing is far more than a work of personal inspiration; it is also a work of universal scope that makes penetrating comments on politics, statecraft, cosmology, aesthetics, and ethics. Roberts brings these themes to our attention, shows how they are integrated into the work as a whole, and demonstrates the relevance of these topics for our own times. "Moss Roberts' commentary is provocative and compelling. The scholarship informing the work is solid, but like the Dao De Jing itself, the scholarship is not flaunted, but rather subservient to the messages of the text itself." —Hoyt Tillman, Professor of History, Arizona State University.